Hullform is the name given to a family of hull design programs. They have been continuously developed since the 1980s, running initially on a large mainframe computer (remember those? ), then on IBM-compatible PCs running MS-DOS (remember those?). It now runs under Windows (including Windows 7) and "x86"-based Linux systems. The source files, Makefile and LCC-win32 project file are now available for download. These files are provided without warranty of any kind, and no support is offered. 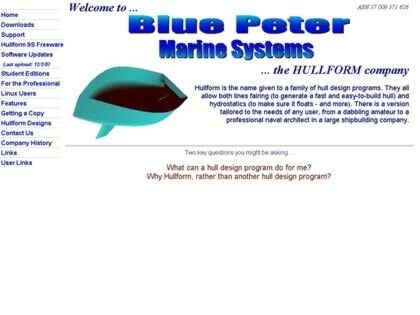 Web Site Snapshot: If available, above is a snapshot of the Hullform web site at http://www.hullform.com/ as it appeared when this site was added to the directory or last verified. Please Note that Boat Design Net has no involvement with the above web site; all content and images depicted in the above thumbnail are the property and copyright of Hullform unless otherwise noted on that site. Description: Hullform is the name given to a family of hull design programs. They have been continuously developed since the 1980s, running initially on a large mainframe computer (remember those? ), then on IBM-compatible PCs running MS-DOS (remember those?). It now runs under Windows (including Windows 7) and "x86"-based Linux systems. The source files, Makefile and LCC-win32 project file are now available for download. These files are provided without warranty of any kind, and no support is offered.